Choosing the right countertops can make a significant difference in the look and feel of a remodeled space. However, it can be challenging to determine which countertops are best for you just by looking at color swatches or reading descriptions. That’s why Express Countertops offers a bathroom and kitchen countertops showroom located in Hanover, Maryland! Our 14,000 square foot facility and showroom is conveniently located in Hanover, Maryland, open 8:30 – 5:30 Monday – Friday. For driving directions to our showroom, please call 410-712-0601. We offer some of the most popular countertop options in our extensive showroom. Whether you’re interested in quartz kitchen countertops or granite bathroom vanities, you’ll find the product you’re looking for here! Discover product samples from all of our premium manufacturers, including Cambria, Formica Stone, and DuPont Zodiaq. You’ll be able to see all colors available and feel the materials, so you can be sure you’re making the right choice. 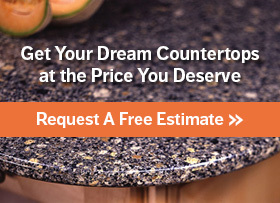 Find the perfect countertops by meeting with consultants! They can assess your needs to show you the best products for your space and budget. It’s easier to find what you’re looking for by focusing only on the products that are well-suited to your needs, saving you time and money. Get answers to any questions you might have regarding materials, colors, installation, and maintenance. We’ll walk you through the buying and installation process so you’ll know what to expect every step of the way. All of our products are fabricated in-house, meaning that you’ll have also have access to the individuals who are building your countertops. We have architects on-site as well, so it’s easy for contractors and consumers alike to ensure that their vision becomes reality. If you’re interested in buying new countertops for your home, stop by our kitchen countertops showroom anytime between 8:30 – 5:30 Monday – Friday! Our experts can help take the guesswork out of the buying process. We’ll match you with the option that’s right for you based on an assessment of your needs and answer your questions. Seeing our countertops will enable you to envision them in your home and ensure that you get the product you had in mind. If you’re interested in bathroom or kitchen countertops in Maryland, DC, or Virginia, or Maryland come to our showroom or call us at 410-712-0601 for more information on how we can help you make the right choice!